Just a couple of hours to the All Progressives Congress governorship primaries, sharp division over mode of conduct of the election has erupted among the two factional executive members of the party in Cross River State, Owojela’s Blog learnt. 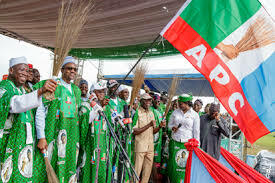 While the Matthew Achigbe-led executive adopted direct primaries as recognized by the national headquarters of APC, the John Etim faction insisted that indirect primaries will be used to elect all the candidates of the party. Both factions of the Cross River APC have been operating independently with two different secretariats in Calabar. Etim John-led executive had recently secured an Abuja high court judgment which declared him the authentic chairman shortly after Achigbe had been inaugurated by the national chairman, Adam Oshiomole. While calling on all party members to close ranks ahead of the general elections, the minister of Niger Delta affairs, Usani Usani said he will go with the position of the law, just as the former senate leader, Victor Ndoma-Egba said the position of national secretariat of the party should be respected.